In the 25 years since William Seabrook ceased trading as a tree nursery, he has built up a business relationship with European nurserymen Botden & van Willegen, and Bas van den Boom particularly. 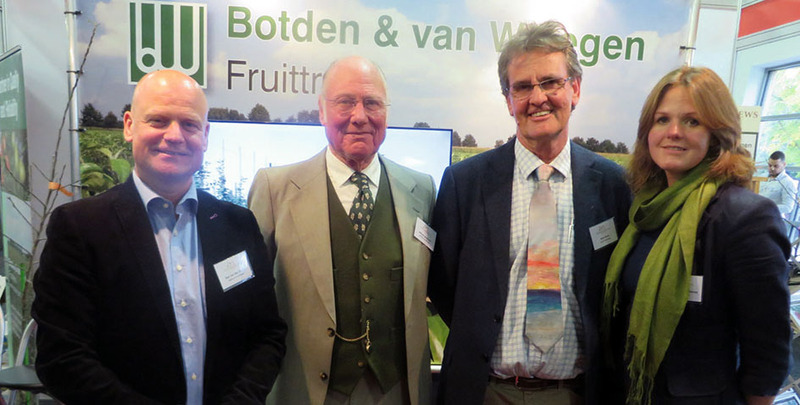 Now that William has retired, Botden & van Willegen has forged a new relationship with Frank P Matthews Ltd of Tenbury Wells, this new arrangement being marked at the National Fruit Show by a reception on the combined stands of the two companies. Frank P Matthew’s Managing Director, Nick Dunn, pointed out that both businesses had similar ethics, with customer care and friendly advice, and the supply of high quality nursery trees, being high on the agenda. The new alliance will provide for both to share propagating skills, longstanding links to breeding programmes worldwide, and access to a portfolio of British cider apple varieties. Each has a substantial database of grower contacts in Britain and Europe, and both are family businesses going back many years and have a detailed understanding of the UK’s industry, recognising that tree quality and price prevail in a very competitive marketplace. In presenting William Seabrook with a collage of 25 years of association with Botden & van Willegen, Bas van den Boom expressed thanks for 25 years of a very successful partnership. Photo caption: William Seabrook (left) receives a gift from Botden & van Willegen’s Bas van den Boom to mark 25 years of successful trading.